Pinoy Carbonara, Carbonara Pinoy Style is our Christmas celebration recipe today. 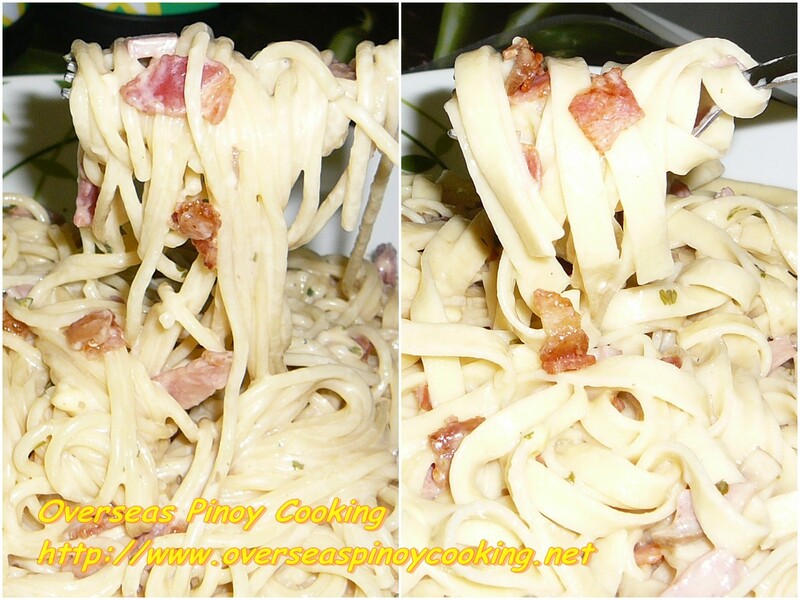 This Pinoy version of carbonara is way far from the original Italian carbonara. We Pinoy usually tweak pasta dishes to our taste and availability of ingredients. Other more common pasta Pinoy dishes that have been reinvented to suit our taste are the Pinoy Spaghetti, Macaroni Sopas and Macaroni Salad. I do have a carbonara recipe in the archive (see that Tuna Carbonara recipe) that was cooked as close as possible to the original carbonara that uses beaten egg as sauce. But today's recipe the used of egg is totally eliminated. 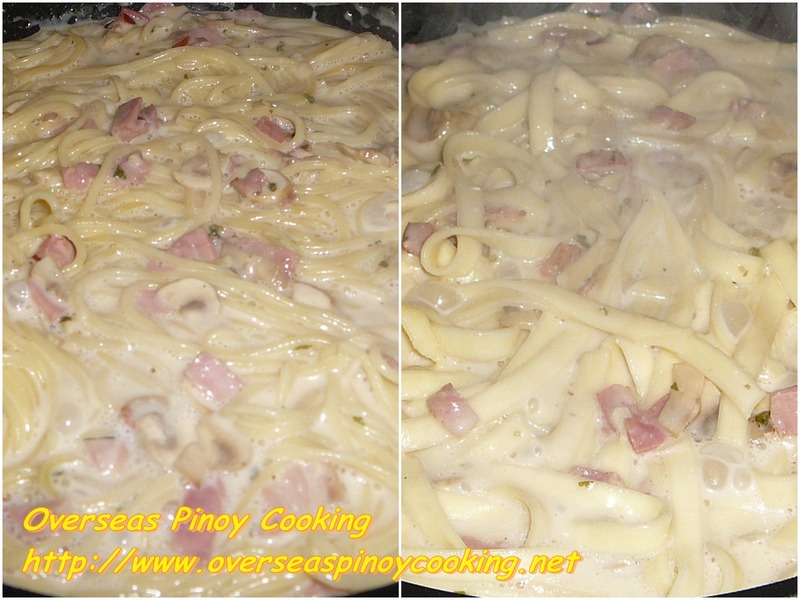 The white sauce of my version of Pinoy carbonara uses mushroom condensed soup as the sauce base, in addition to the use of milk and sour cream. The sauce also includes generous amount of grated cheddar cheese, sliced button mushrooms, dice sliced ham and diced bacon as garnish. For aromatics I just used dried parsley you may use fresh parsley if you want. I don’t like may pasta sweet so I minimised the used of sugar. Watch out on the salt since most of the ingredients are already salty. To serve you may top with some grated cheddar cheese but it’s not necessary. For the pasta you can used either spaghetti, fettuccine or other similar pasta. 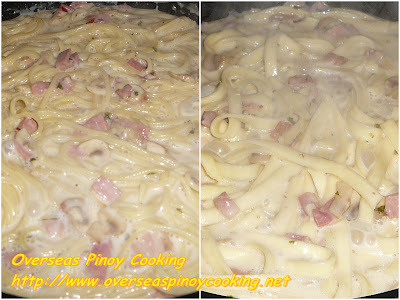 Here is the recipe of my version of Pinoy Carbonara. In a big sauce pan stir fry bacon until crisp, remove from pan and keep aside. Using same pan saute garlic and onion until fragrant. Stir in the ham and dried parsley, stir cook for 3 to 5 minutes. Add in the mushrooms and continue to stir cook for 2 to 3 minutes. Now add in the mushroom condensed soup and and about a cup of water, let simmer for 3 to 5 minutes. Stir in the sour cream and simmer for another minute. Add in the milk and sugar. Season with salt and pepper to taste. At the last 2 minutes of cooking the pasta transfer straight to the sauce pan (drained and leave the boiling water) continue to stir cook for 2 to 3 minutes. The sauce should be runny at this time (it will absorb most of the liquid as it cools down), if not add more water from cooking the pasta. When done remove from the pan, to serve garnish with the fried bacon and with some cheddar cheese toppings. I like the idea of replacing the cream with condensed mushroom soup - it has to be healthier doesn't it? I don't like to eat too much cream. Hi JMom, she will definitely love it. Hi Jeney, too much cream make the dish excessively sweet, I am not a fan of sweet cream myself. I use Knorr Cream of Mushroom soup and all-purpose cream instead. It makes it less "nakakasuya". Thanks for sharing and for your support. pede po substitute ung cream of mushroom n powdered n,dissolve lng po s milk,seasoned n din ito...i have tried this,masarap po..